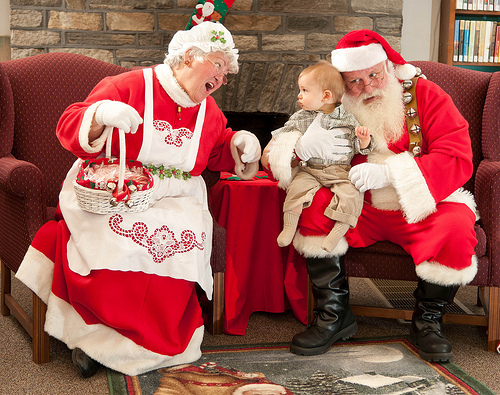 Back in October we visited a local library that had a visit from Santa so that families could get a picture before Christmas, to use for cards. Trying to make Patrick at ease and maybe even smile a little, Mrs Claus kept making faces at him, while Santa just kept trying to pose for a photo — and this is the result. See the original on Flickr. Powered by the Patrick theme and Movable Type Advanced! All content copyright © 2003-2015 by Sherree and Dan Wolfgang, uiNNOVATIONS. This photo for our Christmas card was used to generate the color palette for this site. Read more.